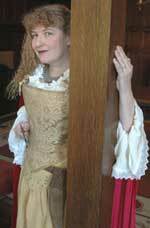 Irish legend abounds with stories of Grace O'Malley, a pirate queen who sailed the high seas in the 16th century. Even more compelling, the colorful stories of her life can be documented in fact. Not only did she fight against the conquest of Ireland by its powerful neighbor, England; she commanded an army of men and remained a leading political figure in a time when women had no personal power. Her political power is demonstrated by her historic, and highly successful, meeting with Queen Elizabeth I. Clearly, Grace O'Malley was significant not only for the colorful legends she engendered, but as an Irish leader during the Renaissance. The stories of Grace O'Malley's life capture the imagination, but also illuminate the era in which she lived. From commanding an army of 200 men, to giving birth to her fourth child at sea, to imprisonment in jail, to her famous meeting with Queen Elizabeth, Grace's escapades engage our modern curiosity and help to explain an important era of transition in Irish history. Through the story of Grace O'Malley, American audiences can begin to understand the contemporary political struggles in Ireland by learning about the era in which these conflicts first arose.